Very few golfers ever compete in the Ryder Cup, the biennial match play tournament between the best American golf pros and the best from Europe. On the other hand, Blaise Gavlick and some of his golfing buddies found a way to recreate a bit of the same match-play excitement, at a level most of us amateurs can enjoy. Gavlick, a Sussex Pines Country Club member and Wilmington Trust investment banker, helped to form the Delmarva Peninsula Golf Assocation Men’s “B” league, designed for golfers with verified handicaps of six or higher. Last year they began with teams from two clubs. This year, the League has expanded to six teams, a great sign of progress and interest in the competition format. On June 13, the Sussex Pines CC team and the gang from Hunters Oak Golf Club of Queenstown, Maryland competed in the season-opening “B” League match. Twelve players from each club competed in the four-ball matches. Terry Moran & Larry Sharde, HO defeated Lee Peters & Chris Messick, SP 3-0; Ralph Harrison & Bob McVey, SP defeated Pat Weiland & Mike Leishear, HO, 2&1; Gerry Desmond & Ron Lewis, SP defeated Bill Schauer & Mark Norman, HO 3-0; Dave Jefferson & Jack Carlson, HO defeated Kris Scott & Ken Carruthers, SP 2 ½ – ½; Jason Lev & Bill Hartley, HO defeated Blase Gavlick & Bud Townsend, SP 2&1; and Jonas Meyer & Harry Gonyer, SP halved their match with Jerry Hartman & Mike Barba, HO 1 ½ – 1 ½. Team eligibility rules are fairly simple. The teams are sponsored by DPGA member clubs, which must use the USGA handicap system for the players. Individual competitors must have a handicap index that converts to nothing lower than a 6 handicap from the tees used in the matches. The players must also be in good standing with their own club, be at least 21 by the date of the match in which they’re entered, and limit their representation to one club in any year. For each match, the clubs field six two-man teams, with three playing away matches and three playing at home. Matches are conducted from the regular men’s or white tees, and are played at scratch. Three points per match are earned, split by the front and back nines and the overall score for the eighteen holes. Ties earn half-points. At the end of the season, the club with the highest point total is awarded a championship plaque, to be displayed in the clubhouse until the next year’s winner takes it away. Gavlick hopes that teams from other DPGA member clubs will join in the fun. As word spreads about the “B” league, I’m sure they will. 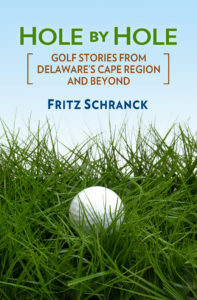 A few weeks ago I played in a pro-am golf tournament with Pete Oakley, the Director of Golf at The Rookery and the 2004 British Senior Open champion, at Cape May National Golf Club. Amateur golfers are not normally expected to use these tournaments as an opportunity to pick up a free golf lesson from the pro. When it’s Pete Oakley, however, he just might have his tongue firmly in his cheek when he decides to volunteer his assistance. On the 409-yard par 4 eleventh hole, for example, I hit a big sweeping hook tee shot that flew into the pond running along the left side of the narrow fairway. After the laughter died down, I tried to comply. Naturally, that second drive shot off toward the rough on the right, and stayed there.